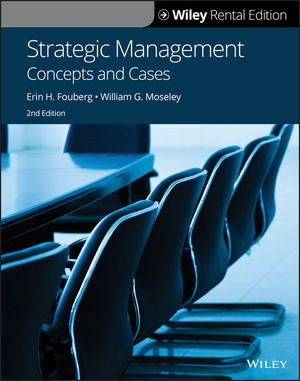 Strategic Management delivers an insightful and concise introduction to strategic management concepts utilizing a strong mix of real-world contemporary examples. Written in a conversational style, this product sparks ideas, fuels creative thinking and discussion, while engaging students with the concepts they are studying. New Strategy Tool Animations: Several new Strategy Tool animations have been added to further teach students how to use the available course tools. For example, two of the new animations cover how to analyze a case and how to create a strategy canvas. Section Sidebars: “Strategy and Your Career” sidebars have been added for each section of the course to help students see a stronger link between what they study in the classroom and the things they care about most: landing great jobs and leading fulfilling lives. Sidebars are supported by a 2-minute video that links key course concepts to landing a job and being successful in a job. A SharperFocus: This course now better focuses on answering just four critical questions: “Where should we compete?”; “Why do we win?”; “How do we win?”; and “How will we win over time, or sustain our competitive advantage?” In addition, several course sections now include content detailing new thinkingabout issues such as industry, resources, and strategy implementation. New Content and Cases: This course has been updated to include a number of new content section introductions. One section, for example, now features the failures of Wells Fargo in 2016 to highlight the role of corporate governance. Another section, on corporate strategy, has seen the introduction of two more entries to the previous listing of ways firms can add value through diversification. In addition, ​new cases have been added involving ESPN, CVS Pharmacy, Tesla, and Valient Pharmaceuticals, among others. The Dyer case library continues to grow and each year one or two new cases are added to keep strategy teaching fresh and current. A Conversational Writing Style: The succinct and unique conversational writing style of Strategic Management helps students make connections with the concepts they are studying. Currency and relevancy stand out in this course. Contemporary Real-World Examples: Rich stories and cases contributed by industry professionals enable students to experience the complexities of the real world. Organizations featured range from large, well-known brands to small, entrepreneurial startups. Each is chosen to illustrate concepts in differing environments. Career Readiness Tools: Feature boxes display 1-2 minute videos that link key course concepts to career-readiness in the work-world and provide helpful information for landing a job and being successful in a job. “Classic Cases” Casebook: The ever-expanding Casebook feature offers new, shortened, and updated “classic” cases involving familiar companies (e.g., Walmart, Coke, Pepsi, Intel, Southwest, Nike, etc.) and others.